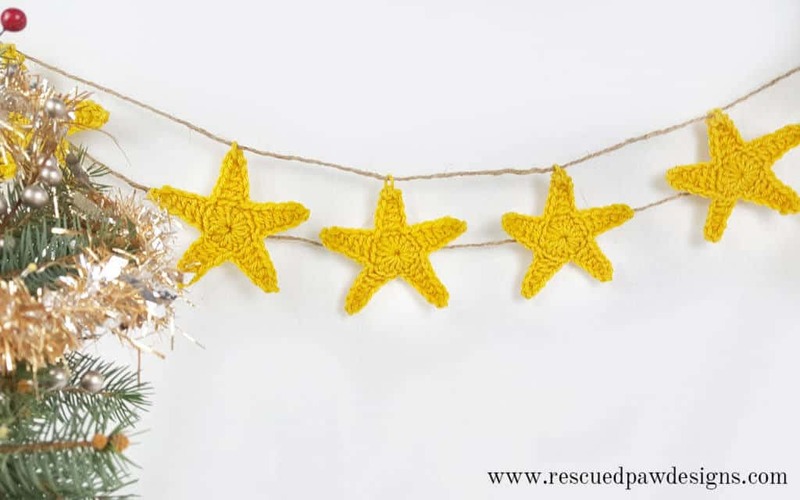 This crochet star garland will be just the touch you need to add a little handmade to the holidays. 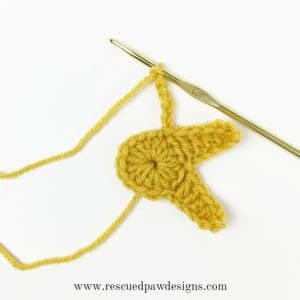 With my easy 5 point crochet star pattern you will have this whipped up in no time at all! Read on down for the full, FREE crochet pattern! 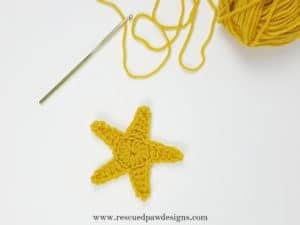 The yarn that’s perfect for this simple crochet star! For this crochet star garland I decided to use Lion Brand Vanna’s Choice because it is a solid acrylic yarn and is very easy to block! Which will come in handy later when we want these stars to hold their shape. 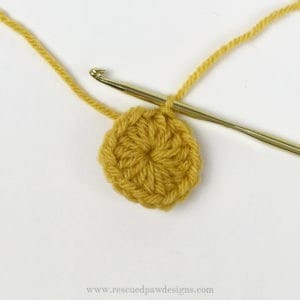 I went with a classic yellow crochet star, but any yarn color in Vanna’s Choice would look perfect! I used some medium thickness twine to hang up my garland, but you could use any type of string or yarn to hang yours up if you prefer. These stars work up fairly quickly. These crochet stars do take at least a day to finish because of the blocking, but it is well worth it for a handmade holiday decoration! 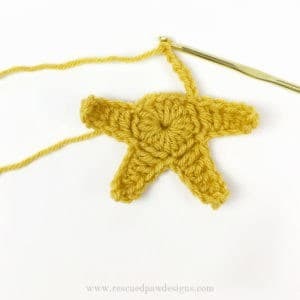 Ready to get started on this crochet star pattern? 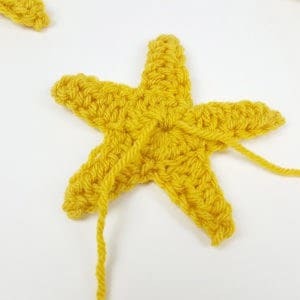 If you think you are ready to make these crochet stars just scroll down to start crocheting! And to help you out I listed all the items below you will need to complete this fun project. Add to your Ravelry Library to make later. If you are ready to make this holiday star decoration, then read on down for the full, FREE tutorial with step by step pictures! 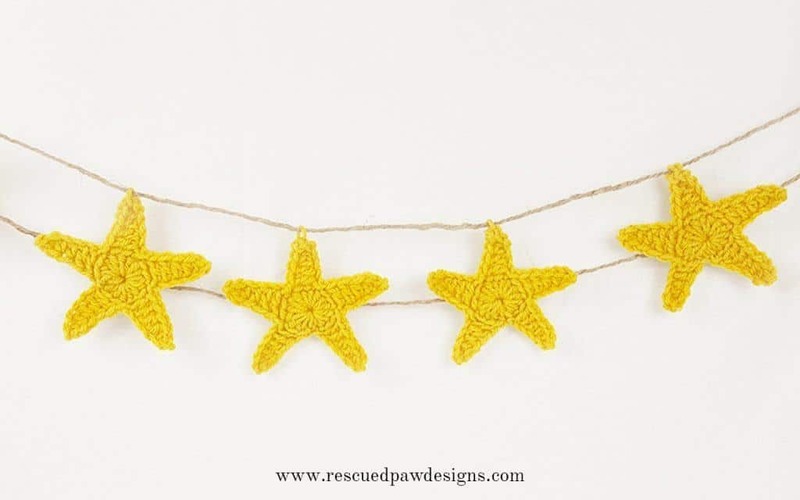 FREE crochet star & crochet star garland pattern! Round 2: *CH 6, in 2nd CH from the hook SC, HDC in next 2 CH’s DC in next 2 CH’s, SK 2 ST, SL ST into next ST, Repeat from * for a total of 5 points (to make the star) finishing with the last SL ST into the SL ST of the previous round. 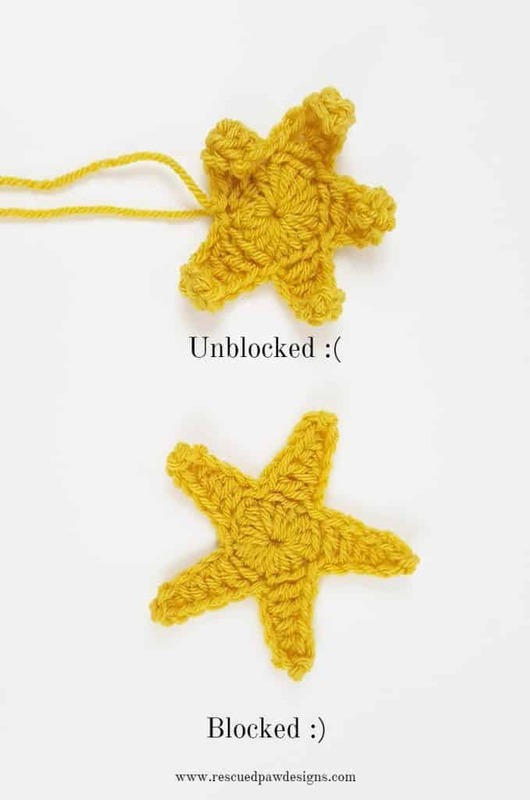 Blocking: I highly recommend blocking your crochet star afterwards to give it a nice flat, clean look otherwise it will start curling up at the edges. 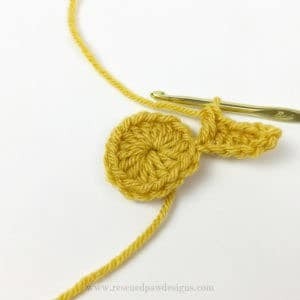 A great tutorial can be found on Moogly Blog on how to wet block a crochet project and comes in handy with so many crochet projects to give them a neat finished look. I finished mine with hair spray after I was done to make sure they really held their shape. Crochet Garland: After you have made at least 4 stars for the crochet star garland the fun part of stringing them all together begins! Take your twine and cut into the desired length you need for your garland. 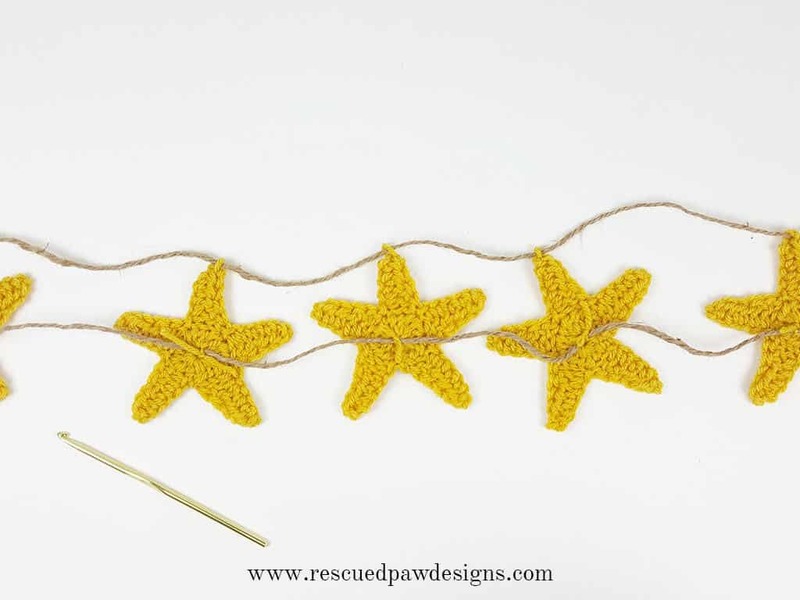 Lay out all your stars backside up, then lay the twine across. 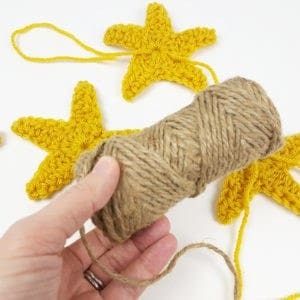 Attach to the stars with the loose yarn ends as shown in the picture. Attaching Top Twine: Now that the middle twine is attached next we are going to attach the top twine to the crochet stars. Cut your desired length of twine once more preferably the same size as the previous piece. 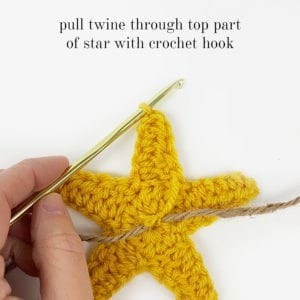 With the stars still back side up insert Crochet hook into the top of the uppermost point, then pull twine through to attach to the star. Repeat this step for all stars on your garland until you are done. 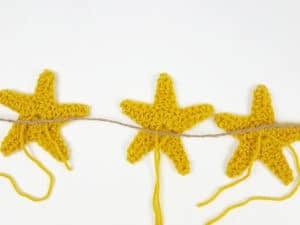 This is what the back side of your star garland will look like after you are done attaching the twine. 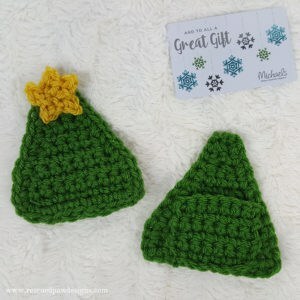 Once you are done, you can use these to decorate for the holidays and take pride in the fact that you made them yourself! I am planning on hanging mine in front of my tv stand with some lighted Christmas garland! 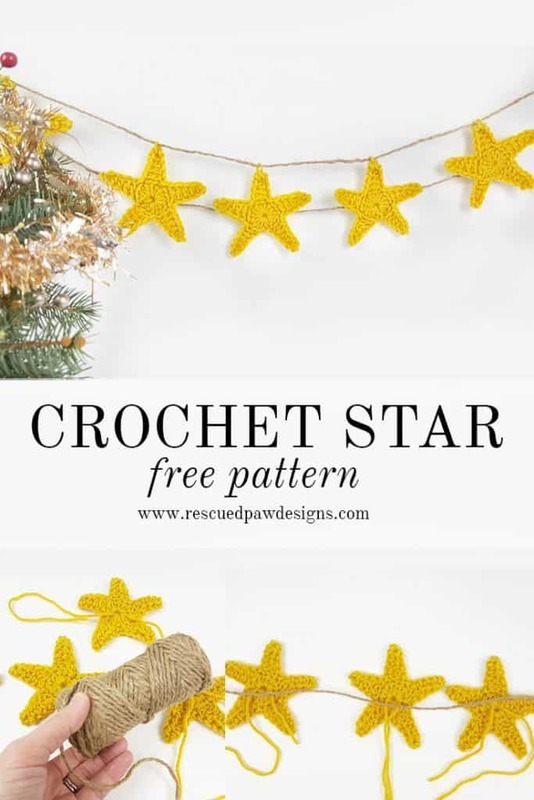 Also, these crochet stars would also make a great handmade DIY Christmas tree ornament if you would prefer that over a crochet star garland. Thanks for checking out this FREE pattern!